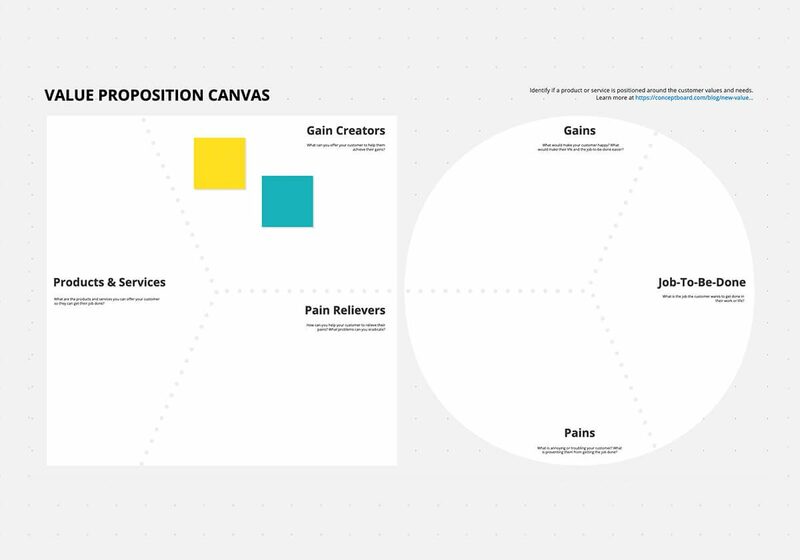 What is a value proposition canvas? The value proposition canvas was originally created by Alex Osterwalder, to show where a product offering overlaps with the customer’s needs. The template helps teams get into the shoes of their customers, and discuss marketing campaigns and new product planning in a creative but structured way. If you’re working with many people from different departments it can be tough to get on the same page. The canvas help focus discussions and helps your team quickly figure out the core message or direction for a new campaign. Peter created a canvas focused on getting teams to think more deeply about the customer user experience, and distributed it under a Creative Commons license, so everyone can print it out and use it in brainstorming meetings. If you prefer to have a real-time collaborative online whiteboard where you can work together on the canvas though, grab the template at the bottom of this article and start using it in Conceptboard. To get you started, here’s an overview of the different sections of the template. You can use sticky notes, scribbles, images, and videos to add ideas to the board. Keep the original board in a template project folder, and duplicate a copy of the board whenever you need a fresh version. Features – Describe how your product works and what it does. Benefits – What does your product do for the customer? How does it make their life better? Wants – Focus on the emotional needs of the customer. What do they want to be, do, or have? Needs – The other side of the coin: what job is the customer trying to get done, and what do they need in order to get it done? Focus on figuring out the rational and logical motivators of your customer. Substitutes – What are some of the products or solutions that your customer is already using to solve their problem? You may not consider these direct competitors, but whatever your product does, it must offer a better solution that whatever your customer is already using (or doing) to solve their problem. Click the link above to open up the template. Make sure you’re logged in (or sign up) so you can save the board to your boards overview. Then check out the Conceptboard Template Gallery, where you can find other service design templates like our Customer Empathy Map!